Who doesn't need some skulls to liven up their next fantasy or horror project? 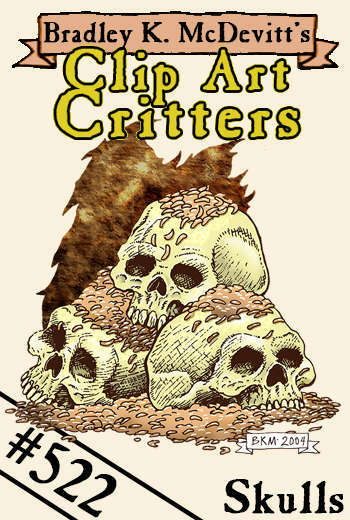 A simple pile of skulls with maggots crawling all over them... perfect family entertainment! Subject to the included license information. Printed size will be up to 1575 x 1575 pixels (5.25" wide by 5.25" tall) as a layered300 ppi TIFF, large enough to be used as a quarter to 1/3 page! Included are a grayscale version and a lo-rez version for easy online advertising. This artwork is copyright (C) 2019 Bradley K McDevitt. You can use this image in commercial or fan projects, however you may not publish it as clip art. Any company that uses images from 'Clip Art Critters' is required to place the artist's name amongst the credits.